Woke up this morning and the arms felt like lead, once moving around they soon loosened up although they felt like lead again when I began to paddle! 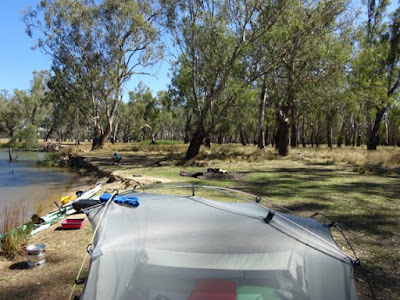 It is forecasted as a fine sunny and warm day today - 30 degrees and it will be like that for the next week, by Sunday it will be the mid 30's so plenty of sunshine to charge up the batteries on the solar panels. Slathered myself with sunblock this morning - never thought I would say this but by crikey I am burning out on the river! generally when you cycle you get burnt on one side of the body but since this river bends all ways you get an all round suntan .. with the exception of the back of the legs ... they look unusually white compared to the front which are brown! I have ditched the neoprene gloves and have opted for none. My hands were sweating in the gloves and I was getting small blisters. Since not wearing gloves the hands have had no blisters assuming because the hands stay dry (not sweating) although they are getting sunburnt so I have to sunblock them too!!! 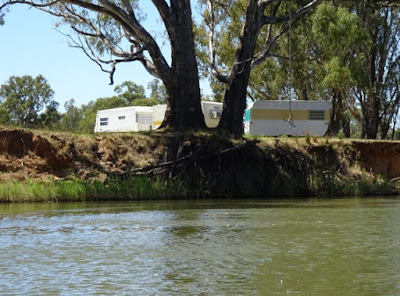 I am all for coming along and camping in whatever along the Murray river but to leave your caravan there to sort of 'claim' that spot as your own when it is on public land (3 chain rule - as long as there is no private claim to the waterfront or a house) well that is just not right ... I mean it is okay for Neil and I as we are small and we can just camp there if no one is there but if you were a bigger group and like that spot but couldn't fit due to vans being there but not the owners then that is a bit rich for my liking! 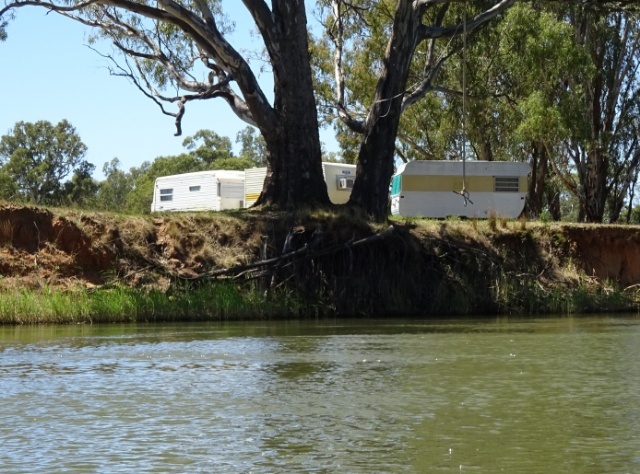 Anyhow you probably would say that the river is long enough to fit all, not neccessarily so as there sometimes is not great spots to land, beach or launch so places like the ones with the permanent structures take up spots with beaches and launches. 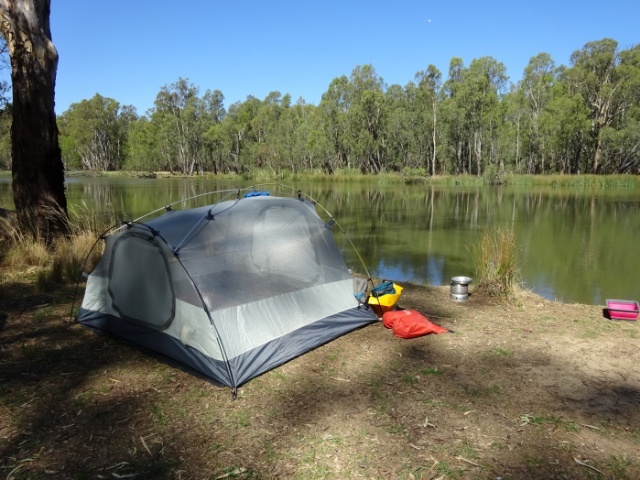 I mean one thing Gordon, and I assume most kayakers would too, found difficult is there is not many spots to land the kayak, usually there is plenty of spots for the tent but to land or beach the kayak is impossible! 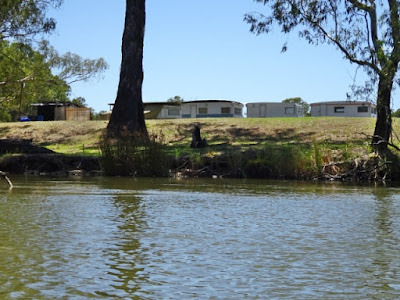 So we are getting closer to Lake Mulwala and we also have the Ovens river south of us (which creates a massive lagoon system that one could get lost in!) and when you look at the map of the Murray river all you can see are a mass of creeks, billabongs, rivers and lagoons and you begin to wonder just where the heck is the Murray river in all of this! I have the map with me and I have to admit I am getting pretty good with navigating this river despite the lack of km markers. 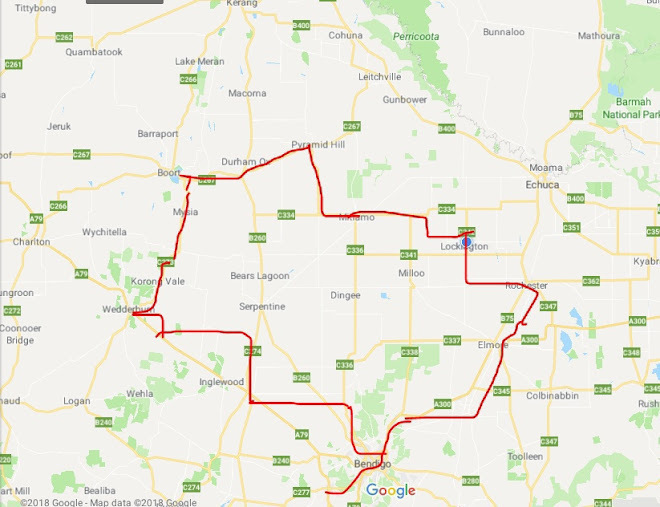 we have decided today was our 3rd straight day of 30kms so we will have a rest day and try to tackle Lake Mulwala on Saturday as we think it might be a long day if we are to go a little beyond Yarrawonga and we also still have to get to the start of the lake which is about 14km away. I tell you we are about 4km from Bundalong and every man and his boat, jetski and speedboad is passing by us! Dad if you read this ... I tried ringing the landline but no one answered so we are having a rest day here tomorrow when is the best time to skype - in the evening? send me an email as to when the best time is!